UPDATED: Thu., Jan. 18, 2018, 10:38 p.m.
Federal offices in Eastern Washington and North Idaho are preparing for a potential government shutdown as lawmakers take the fight over a stopgap funding measure down to the wire. While the House passed the bill Thursday, if the Senate doesn’t pass an appropriations bill by midnight Friday, federal employees could be furloughed, welfare programs could be frozen, wildlife refuges could be closed to visitors and federal courts would be subject to disruptions. Essential activities that would continue include military and intelligence services, federal law enforcement, air traffic control and medical care at veterans hospitals. Social Security and Medicare checks, in addition to food stamps, would still get distributed. Americans would continue getting mail, too, as the Postal Service has its own funding stream. The last shutdown, which lasted 16 days in October 2013, hurt local implementation of the Women, Infants and Children program, which provides checks to low-income mothers and pregnant women for healthful foods. 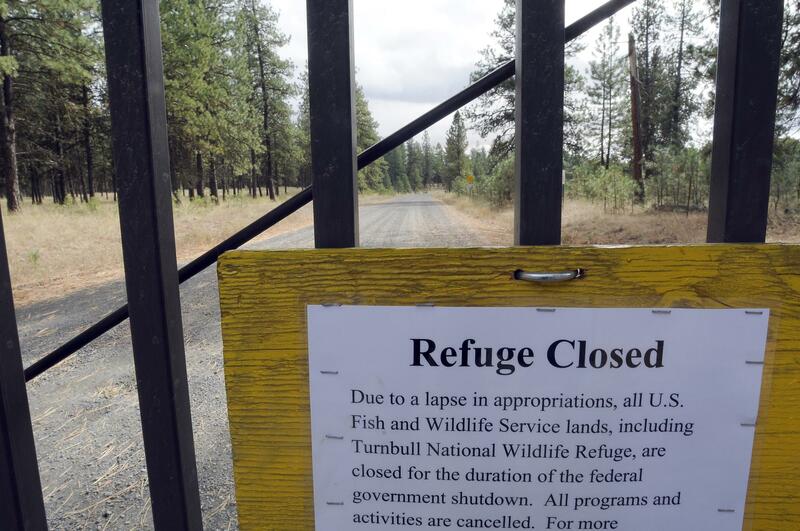 The Turnbull National Wildlife Refuge near Cheney was closed, and Spokane offices of the IRS, the U.S. Geological Survey, the Centers for Disease Control and Prevention and other agencies were dark. Additionally, Fairchild Air Force Base announced furloughs affecting 300 civilian workers and 248 inactive National Guard members, although its tankers continued flying refueling missions. At the time, some 5,000 people in Spokane County were on the federal payroll. This time around, the potential impacts are unclear. Furloughs and service disruptions could depend on the duration of the shutdown and how much money agencies have in their reserves. In an email to staff Thursday, Washington Employment Security Department Commissioner Dale Peinecke wrote that reserve funding would last for at least a little while in the event of a shutdown. “We believe that ESD has enough state and federal funds in the short term to avoid implementing temporary layoffs and to allow us to continue passing funds to our local workforce development boards so we all can continue serving our state’s businesses and workforce,” he wrote. A spokeswoman for the Washington state Employment Security Department said the agency was preparing for a potential influx of unemployment claims. Joe Harrington, the interim U.S. attorney for the Eastern District of Washington, emailed a Justice Department statement that says “a high percentage” of the agency’s personnel and activities would not be affected by a shutdown. In 2013, however, about a quarter of the 57 employees who worked in the U.S. attorney’s office in downtown Spokane were sent home. The funding battle in Congress has largely hinged on provisions for the Children’s Health Insurance Program, or CHIP, which provides assistance to about 4,100 kids in Spokane County whose families earn too much to be eligible for Medicaid but can’t afford other plans. Democrats also have called for the spending bill to include a measure protecting some 800,000 immigrants known as “dreamers,” who entered the United States illegally as children and now face increased risk of deportation because of an executive order by President Donald Trump. Published: Jan. 18, 2018, 5:12 p.m. Updated: Jan. 18, 2018, 10:38 p.m.